For other uses, see Bendish (disambiguation). Bendish is a hamlet located in the parish of St Paul's Walden in Hertfordshire. In the 18th century, Bendish was a small town. 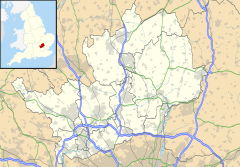 It is about 3 miles east of Luton, 5 miles south of Hitchin and 4.5 miles north of Harpenden. Many services such as the grocers, the 3 pubs and the Church have all closed. Bendish is not a nucleated Hamlet, due to the effects of rural to urban migration through the unemployment of residents as of the result of mechanisation. Farmers houses were knocked down leading to the somewhat staggered placing of the current houses today. There is currently an active phone-box and a postbox available for the public.